“Cassini Spacecraft Dives Between Saturn and its Rings!” – Google Doodle from April 26th, 2017. For the past twenty years, a whopping 1.2 billion kilometres away from Earth, a little unmanned spacecraft called the Cassini-Huygens has been orbiting Saturn and faithfully collecting data and beautiful pictures of the icy, ringed planet and its moons. One of Cassini’s most important discoveries was of the potential habitable environments of two of Saturn’s moons – Enceladus, which is “among the most likely places in the Solar System to host alien microbial life”, and Titan, which possesses one of the most Earth-like worlds ever encountered. In April 2017, NASA decided to officially end Cassini’s mission and retire the spacecraft. The main reason for doing so was because the spacecraft is running low on fuel and once it is completely exhausted, the mission operators will be unable to control its course any further. In an event that scientists have termed the Cassini Grand Finale, the spacecraft is doing a controlled spiral into Saturn’s atmosphere and will eventually crash into the planet and burn up in September this year, sending data and images back to Earth until its very last moment. You might wonder: Why make Cassini crash at all, effectively destroying all of its components? Why not bring it back, or leave it in a stable orbit around Saturn or one of its moons? All the possibly less destructive ends to Cassini’s mission have been thoroughly considered by NASA, and they have finally decided that the best course of action would be to dispose of Cassini into Saturn’s atmosphere, preventing its collision into either Enceladus or Titan, and ensuring that Cassini does not cause any “interplanetary contamination” of the two moons with microorganisms and other possible contaminants from Earth. 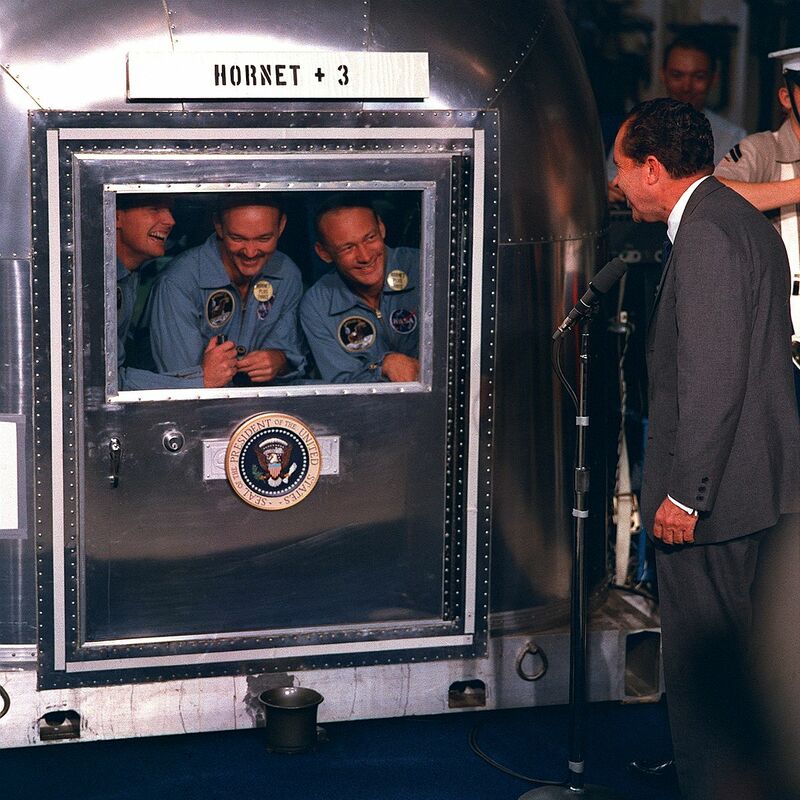 Apollo 11 astronauts Neil Armstrong, Buzz Aldrin, and Michael Collins talk with President Nixon from the Mobile Quarantine Facility, an anti-contamination measure devised to prevent backward contamination from the Moon. Consider this hypothetical situation for a moment: You are a scientist looking for signs of life outside Earth. After a long and arduous search, you have finally struck proverbial gold: DNA signatures on a seemingly uninhabited planet! However, on sequencing the samples (and much to your dismay), you just found out that those DNA signatures merely belong to microbes found on Earth. And to add to your embarrassment, they landed up there via the spacecraft that you sent to the planet to study it. It is of two kinds: Forward contamination, where viable organisms are transferred from Earth to a planet, and backward contamination, where extraterrestrial organisms are brought onto Earth. The consequences of this kind of contamination are many, and hence interplanetary contamination has been a very grave concern for governments ever since space exploration became a reality with the launching of Sputnik by the USSR in 1957. The issue of interplanetary contamination was first brought up as early as 1956. Planetary protection – a term used to refer to the preservation of other worlds as they would exist in their normal states – quickly became a new priority for a number of committees, including the Committee on Space Research (COSPAR) in 1959, which continues to meet every two years till date to discuss and recommend measures for preventing interplanetary contamination, among other issues. In 1967, the United Nations’ Outer Space Treaty (formally titled the Treaty on Principles Governing the Activities of States in the Exploration and Use of Outer Space, including the Moon and Other Celestial Bodies) was formulated and ratified by the US, the UK and the erstwhile USSR. Till date, 106 countries have signed this treaty. While seeming like something well within the realm of science fiction, the Outer Space Treaty is very real and forms the foundation for international space law. In an ironic twist of fate, Cassini’s own discovery of the potentially habitable environments present on Enceladus and Titan will lead to it’s demise by careening into Saturn. Cassini was sterilised before launch in 1997, but microbes may still have survived aboard the spacecraft. In order to completely get rid of these unwanted stowaways and prevent contamination of the two moons, the probe will incinerate on entering Saturn’s atmosphere. Why Bother with Space Cleanliness? With waste disposal becoming an increasing problem on our planet, the day is not far when we may even have to resort to sending all our trash to outer space. Thanks to a never-ending supply of sci-fi movies and novels, we now have some idea of how quickly things can go wrong if biological samples from outer space are brought back to Earth without proper containment. However, it has seldom been discussed what would happen if flora and fauna from Earth happened to reach another planet with a suitable environment, and even began to thrive there. The Earth is home to many “extremophilic” organisms, which survive easily (and even revel) in extreme environments like volcanoes, hydrothermal vents and at sub-zero temperatures. It is possible that if these organisms hitched a ride on a spacecraft to an unexplored planet, they may be able to survive there. The presence of life from Earth might mask the extraterrestrial life on that planet, making it a lot harder to search for and recognise. With the introduction of new species from Earth to another planet’s environment, the problem of competition also arises. As has already been observed on Earth, the invasive Earth species could outcompete native species for common resources and eventually lead it to their extinction. Pathogenic microbes from our planet could also end up on unexplored planets and wipe out any life forms, although it has been discussed that this seems unlikely, because pathogens need a host they can adapt to and cause disease in. The writer, Mollika Maiti, is an author and scientist from Bangalore. She specialises in microbiology and is an avid quizzer. This post was first published on Mollika’s personal site, Powerhouse of the Cell. Very interesting and informative. Enjoyed.